Taylors Garages Premier Division: Billinghay Ath 4 Fishtoft 2, Coningsby 7 Kirton Town 1, Old Leake 9 Pointon 0, Skegness Town Res 2 Benington 0, Spilsby Town 0 Swineshead Institute 1, Wyberton Res 3 Heckington Millers 3. Taylors Peugeot Division One: Fosdyke 2 Friskney 3, Sutterton 1 Woodhall Spa Utd 6. Taylors Ford Division Two: AFC Tetford 4 Holbeach Bank 2, Easter European FC 0 Railway Ath 5, Kirton Town Res 3 Billinghay Ath Res 4, Park Utd 7 Pointon Res 1, Sibsey v Coningsby Res pp, Swineshead Res v FC Kirton pp. Taylors Vauxhall Division Three: FC Hammers 7 Pointon A 1, Friskney Res 0 Leverton SFC Res 3, Spalding Harriers v Northgate Olympic pp. 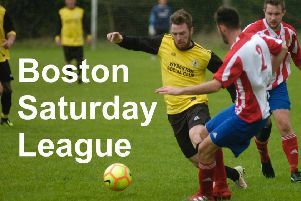 Target Newspapers Challenge Cup, semi-finals: Freiston 0 Leverton SFC 7, FC Wrangle v Boston College pp. Main Ridge Take Away Reserve Cup, semi finals: Fishtoft Res 1 Swineshead Res 3, Spilsby Town Res 4 Old Doningtonians Res 2. BB Insure Willoughby Cup, round two: Old Doningtonians 8 Mareham Utd 3.